These are only a few of the many unique and stylish brands that we carry. Inside our store you will find a wide variety of exciting pieces that are the perfect look from everyday to the most special occasions. We will be updating this page as we continue to add more brands sold by Cambridgewear as well as introducing new lines, so keep checking up with us! Custom-made European linen fabrics in relaxed styles. Handcrafted women's dresses and tunics by designer Sulu Grant. Embroidery and block-printing are performed by hand by individual craftsmen in India. 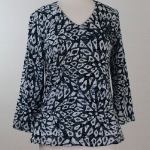 Salaam is a Vermont Company with a beautiful line of comfortable, versatile clothing designed to fit every body. Timeless designs are made from fine European fabrics, with an eye for affordability, comfort, and fit. Le Galeriste is the fusion of art and high fashion. The wearable art gallery showcases exclusive works of art from some of the world’s most respected artists, produced on high-end clothing made in Montreal (Canada) in limited and numbered editions. Forest Lily is a line of stylish contemporary ladies dresses with a diverse selection of day-to-night looks for every woman & every mood. As each fabric is carefully hand-picked and each print made exclusive, Forest Lily dresses are designed to enhance a woman’s natural beauty with flattering silhouettes, colorful prints, novelty fabrics and timeless classics. Skovhuus Strik is a Danish knitwear company who have been producing higher quality goods since 1972. Now run by the second generation of the Skovhuss family, each garment is still produced at their factory in Herning, Denmark using higher quality sustainable yarns. You can feel the softness in all of these pieces. Komarov are well known for their finest natural and man made fabric blends and providing an unbeatable fit. They are hand or machine washable, wrinkle free and light weight. Ideal for the busy business or leisure traveler who wants to look chic at a moment's notice without the need for dry cleaning. Habitat designs are meant to move you comfortably and stylishly through every part of your live. From the office, to dinner with friends, book club to college reunion, Habitat clothes are the ones you can truly live in. Timeless fabrics, colors & shapes are inspired by global travel and total immersion in fashion trends and cultures. For nearly three decades, Fresh Produce has delighted women with it’s original prints, vibrant color and comfortable styling. Today, the company designs and manufactures a leading brand of women’s clothing that is primarily made in the USA. Style and comfort. These soft, lightweight garments are pieces of unique workmanship. The richly colored jackets are a bright and fun accessory whether its an autumn picnic or a special night out. Versatile and expressive, a great way to make your ensemble both elegant and fun. Designed for women who want modern, trend-appropriate clothing that balance casual and career with an eye for fashion. Young in spirit, realistic in fit and tremendous quality. Hand painted, hand stamped, sun dried and fairly traded wearable art. Known for comfortable, colorful, playful tops, Su Placer's batiks are designed in upstate New York and then hand made by fair trade artisans in northern Ecuador. Each piece is a unique one of a kind piece of wearable art. Hand knit in Nepal exclusively for Lost Horizons. 100% wool. Knit wear is made up of high quality sheep wool imported directly from New Zealand and Australia. The raw wool is machine spun in Nepal and then hand dyed, using high quality Swiss dyes, in our dying facility in Kathmandu. Fair Trade Federation Member. Very Vineyard is all about color and prints. Many of these batik fabrics being inspired by flowers and plants. Made in Vermont, Fat Hat creates soft, easy clothing for women that reflect Vermont's lifestyle and comfortable attitude about clothing. Yasuko offers original one of a kind clothing with Japanese inspired silhouettes. Made in soft cottons and rayons, their clothes have a simple elegance with feminine accents like their pleated sleeves. Made in the USA. Moonlight’s lightweight and easy-to-care for tops and jackets are beautifully tailored, with interesting textured fabrics, unique buttons and accents. Made in USA.